Since the 1960s Disney has been turning their version of A.A. Milne’s bear-with-very-little-brain into a highly successful franchise. After a series of short films, three of these were compiled to form Disney’s 1977 animated classic The Many Adventures of Winnie the Pooh, and as a result of a number of child-focused televisions series and spin-off movies (such as 2000’s The Tigger Movie) Disney’s Pooh has become as familiar, though also perhaps not as well cared for, as the Milne and Shepard original. By returning the character to the main line of their animated theatrical releases Disney seems to be attempting to reclaim the integrity of their version of Pooh. Thankfully, the attempt succeeds. As per Disney’s original film, the narrative is comprised of a series of Milne adaptations. However, unlike the portmanteau nature of that film, the various narratives are here combined into one feature-length story in which all run consecutively - a move that may infuriate the Milne purists, but which works, and also prevents the film from simply re-treading the narrative formula of the 1977 version. Whilst many of the characters are unchanged from those we have come to know and are well-represented on screen (Pooh, Eeyore, Tigger), Piglet is unfortunately somewhat underused and thus rather underdeveloped. Owl has also undergone slight modification, mainly as a result of casting, to produce a more nuanced representation. Part of Owl’s charm is the gulf between his actual knowledge and both his and other characters’ inflated perceptions of that knowledge. Whereas the original 70s incarnation possessed a genuinely professorial-sounding voice, the new Owl has less natural gravity, producing a character who appears to be pretending to be more intelligent than he is, a feature which fits very well with the character. The film as a whole, as one would expect from a good adaptation of such source material, is utterly delightful, and also very funny. Much of the humour stems from the various misunderstandings of Pooh and company, particularly in relation to language, and often constructed around some impeccably illogical logic - a common theme of the Milne stories. It is not an exaggeration to say that at times the density and quality of the jokes are comparable to the most anarchic moments of the Marx Brothers (Duck Soup  came to mind numerous times), and there are frequently moments in which so much subtle is humour going on - both visually and verbally - that it is easy to miss things. The animation is also excellent: characters look almost identical to their previous selves, and Disney’s decision to maintain a ‘classic’ style of animation rather than attempt an opulent 3-D CGI version was a good one. Yet that isn't to say that the film looks old. Indeed, it is the skilful and unobtrusive integration of modern modes of animation into the ‘classic’ aesthetic that is particularly effective. 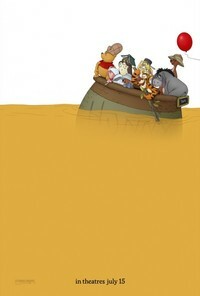 Most of the film looks like incredibly good cell animation, but when Eeyore hides in a river, or a hungry Pooh daydreams that he is in a land filled with honey, the cascades of liquid have the tactile qualities of CGI whilst retaining the charm of drawn animation, droplets exploding in a characteristically Disney fashion. Running as it does to a relatively slight 69 minutes, the film could have been longer, but the filmmakers seem to have wisely realised that this is probably perfect for the narrative; it is also advisable, though, to stay until the end of the credits to catch an amusing additional scene. Ultimately, this film stands as a light-hearted, fun and genuinely funny take on some classic characters, and it is a joy to revisit them in a new version so carefully conceived and lovingly realised as this. This review was published on April 23, 2011.